Peacefully on Thursday April 11th, 2019 at the age of 93. Beloved wife of the late Harold Wilcox. Loving mother of Don, and of Bob and his wife Catherine. Cherished Nana of Michael and his fiancé Sarah, Ashley, Kevin, Gwen and her husband Ed. Great-Nana of Sterling, Alexis, and Porter. Sorely missed by her brother Bob and his wife Pat. 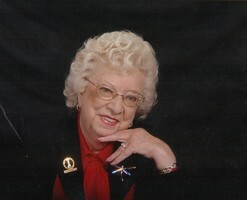 Muriel will be greatly missed by her nieces, nephews, family, and friends. Friends will be received at the Ward Funeral Home 2035 Weston Road (north of Lawrence Ave) Weston, on Sunday from 1pm to 5pm. A service will be held in the chapel on Monday April 15th, 2019 at 11am. Interment to follow at Glendale Memorial Gardens. As expressions of sympathy, donations to the The War Amps would be greatly appreciated. Donations are being accepted for: War Amps Canada. Consider providing a gift of comfort for the family of Muriel Wilcox by sending flowers.